These Valentine table decorations look posh, but they're a doddle to make. They're cheap, quick, and extremely versatile Valentine's day crafts. flexible colored card, around 220gsm/4-sheet/280 microns. The instructions for making the basic tea light holders are here. If you're short on time, you could choose to skip this step entirely; just make the paper hearts and scatter them around glass votives across the table. 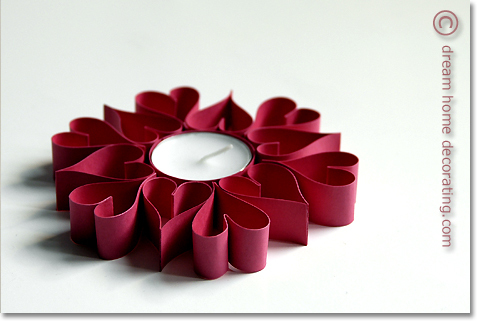 If you've made the tealight holders first, measure their height and cut strips of card in exactly that width. Most of the Valentine hearts on this page were made from 5" (12.7cm) card strips that were 0.7" (1.8cm) wide. Fold each strip over in half. Bend both sides into a gentle downward curve; this will make it easier to get a good heart shape later on. Then, place a small dab of glue in what will become the 'notch' of the heart, press together and let dry thoroughly. Next, place another dab of glue at one bottom end of the strip and press both ends together. When I make these hearts, I somehow always end up with a tip that's just a bit too long and pointy. Or I've managed to squish out some glue at the bottom. If that happens to you as well, no probs: Wait until the heart is fully dry and then snip off a narrow strip at the end. 1. One heart, one tealight, in a neat line down the center of the table. This is actually a rather time-consuming decoration, because you have to make so many tealight holders. Making just the clusters is a good compromise if you haven't got much time! Return from Valentine Table Decorations to Valentine Craft Ideas.